1. For croutons: Preheat oven to 400 °F (200 °C). Spray baking sheet with canola oil cooking spray. Brush baguette slices on both sides with oil. Place on baking sheet and cook until crisp and golden brown, about 10 minutes. 2. For pistou: In blender with motor running, drop garlic through feed tube. Turn off motor and add remaining pistou ingredients. Process to a smooth paste. Turn off motor, scrape down sides of bowl and push ingredients to bottom of blender periodically. When completely smooth, place in refrigerator in air-tight container until needed (for up to 3 days). Just before serving, stir to recombine. 3. For soup: Trim squash and cut into 2-inch (5-cm) pieces. In large saucepan, heat oil over medium-high heat. Add onions, salt and pepper and sauté until tender, about 5 minutes. Stir in squash and cook until just beginning to soften, about 5 minutes more. 4. Add broth and bring to a boil. Reduce heat, cover and simmer until squash is completely tender and beginning to break down, about 15 to 20 minutes. 5. In blender, carefully process soup until smooth. (Do not fill blender more than halfway full. Process in batches, if necessary.) Return soup to pan and bring to a simmer. Remove from heat and stir in lemon juice. Taste and season as needed with salt and pepper. 6. 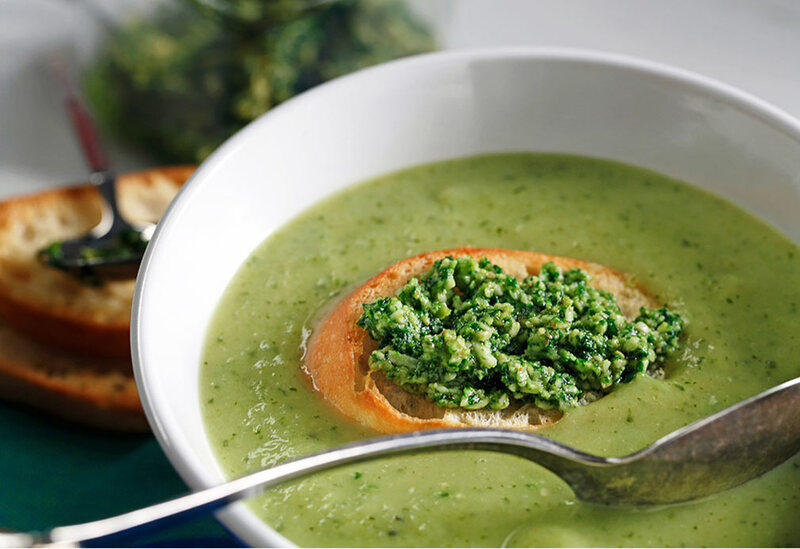 To serve: Spread generous layer of pistou on each crouton and float one on top of each steaming bowl of soup. Serve immediately. 1 cup (250 mL) soup, 1 crouton, 2 tsp (10 mL) pistou. Absolutely fabulous! 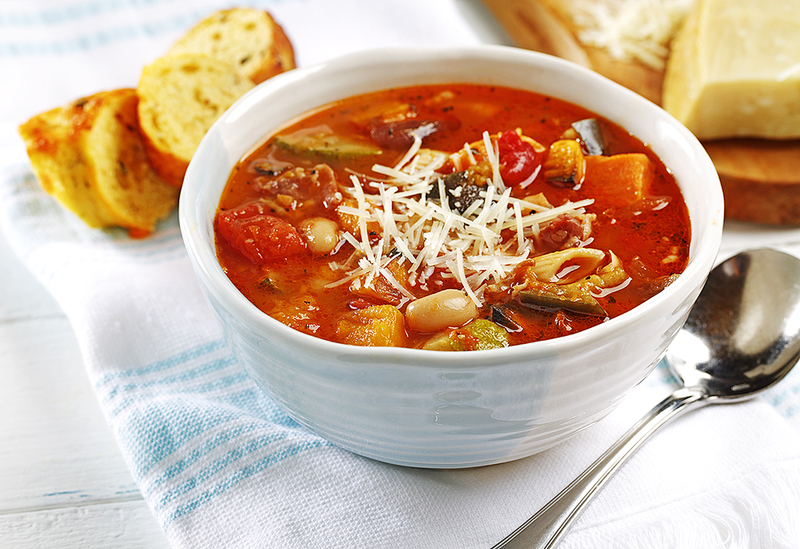 The roasted vegetables with the prosciutto add many wonderful flavors to this earthy, rich Italian vegetable soup. Roast the veggies and then complete the soup in minutes. 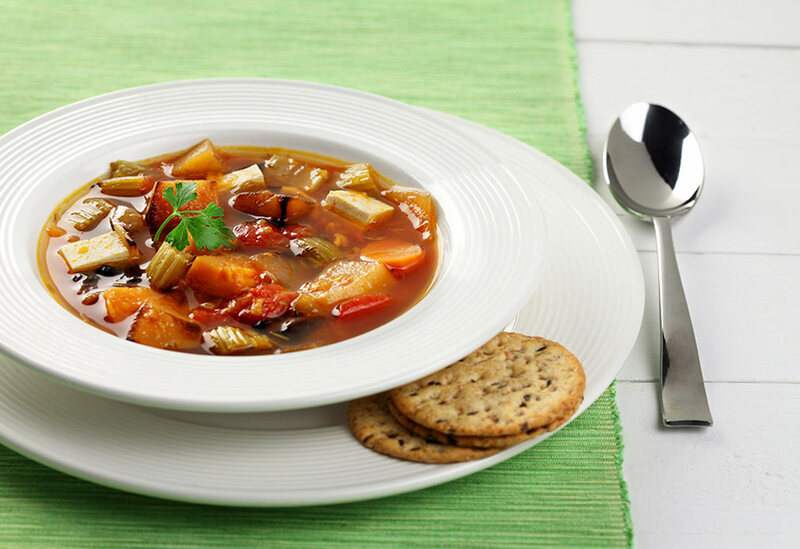 This soup is packed with good-for-you veggies and protein  great for vegetarians and hearty enough to fill up carnivores, too.